It's the weekend. Time to indulgence. Whether you're sipping a minty mojito by the pool or chugging an icy cold beer by the grill, you're going to need something salty to munch on. I've got ya covered. 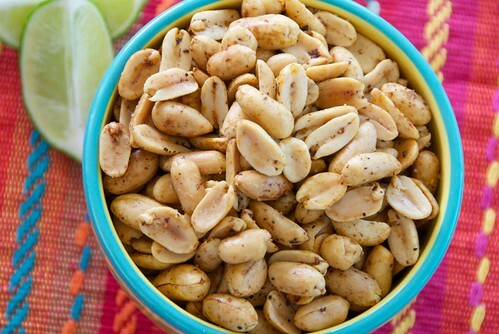 Meet chipotle-lime peanuts. They're everything a munchie food should be -- crunchy, salty, spicy, and sweet. 1. Preheat oven to 300 degrees F. Line a rimmed baking sheet with aluminum foil or parchment paper. 2. In a small bowl, whisk all ingredients except peanuts. Add peanuts and toss until well coated. Transfer to baking sheet and spread out in a single layer. Bake for 20-25 minutes or until sauce begins to dry up and peanuts are fragrant. Note: Peanuts will be sticky because of the honey. Uh, yes please and thank you! These look so perfect... super tasty but easy to throw together! Can't wait to try them! ANYTHING with chipotle works for me. Why, I'd even eat chipotle cupcakes! Love homemade snacks. I always want to buy these kinds of things at the store, but they're usually loaded down with a bunch of crap. So thanks for this! You had me at Chipotle-lime! So much more healthful than chips too! kara-So easy and super tasty! the french-These are healthy b/c they're not loaded with salt and oil. kalyn-They are indeed, and packed with protein. How would these be without the honey? mmmm, looks and sounds delicious! i love the chili coated peanuts, but they are kinda hard to find here. these look even better, and don't have that red stuff to get all over your fingers! Holy yum. I would eat like 2lbs of these. These look addictive. The perfect thing to enjoy with a nice cold beer. Definite indulgence food. Ole! And I have everything in the pantry to make them today. Crunchy, salty, spicy, and sweet all in one handful sounds good to me Susan. These sound addictive! Honey and chipotle in the same recipe? I LOVE it! Sounds great, yep, pass the mojito! Mmm, these sounds addictive! I think I'll make up a batch of these for my son's birthday. Thanks for the recipe! forgive my louche ways if I refuse to wait for the weekend to indulge in delicious spicy salty peanuts. I'll have them whenever I please (please)! Peanuts are my all time favorite snack. Chipotle makes them even better! I chopped this up a little and put them on a romaine salad with a thai-inspired citrus dressing. The dressing had sesame oil plus a little vegetable oil, rice-wine vinegar, orange & lime juice, soy sauce, honey, dijon mustard, and a dash of fish sauce. It was so refreshing, and the peanuts really made it perfect!